All of us know Sauron, of course. He was the main antagonist in J.R.R. Tolkien’s epic trilogy “The Lord of the Rings,” the Second Dark Lord who wanted to control the whole of Middle Earth and plunge it into darkness. Faced with a common threat, all the freedom-loving creatures of Middle Earth banded together to put an end to Sauron’s evil rule. The Dark Lord, they argued, had to be stopped or it will spell the doom for all peoples. Sauron is a dictator, a tyrant. The kind of rule that he had in mind was a dictatorship, where there is a central power (the dictator) that controls everything. Remember the various rings that were given to the Lords of Men, Elves and Dwarves that were all controlled by the One Ring? That, plain and simple, is a dictatorship. Unfortunately, the Philippines was once also under darkness and we, too, had our Sauron. That was Martial Law under Ferdinand Marcos. The dictator was Marcos, and Marcos was Sauron. Why is that so? Here are 4 points that show the eerie parallelism between the two. As a further enticement, Sauron claimed that great power will be conferred on anyone who wields any of the 19 rings. But unknown to them, the Dark Lord forged another ring in secret, using the volcanic fires of Mount Doom. By pouring part of his spirit and his malice unto the One Ring, Sauron was able to fashion a powerful artifact that can dominate all the other rings and bind their wearer to the Dark Lord’s will. Marcos was also a master of trickery. While he was twice elected to the presidency (first in 1965 and then in 1969), the 1935 Constitution prevented him from seeking another term. To extend his rule, he declared Martial Law, abolished Congress and began ruling the country by presidential decree. According to Marcos, Martial Law was needed to crush the looming communist rebellion, counter violence in the streets, and preserve peace and order. He added that he was finally prompted to impose military rule after learning that Juan Ponce Enrile (who was then Defense Secretary) was ambushed by unidentified assailants while on his way home to Dasmariñas Village on September 22, 1972. That same night, Marcos allegedly signed Proclamation 1081. But in his book “Dead Aim,” journalist Conrado de Quiros claims that on the morning of the same day, Enrile received a telephone call from Marcos telling him, “Make it look good, Johnny,” hinting that the entire ambush was a fake. 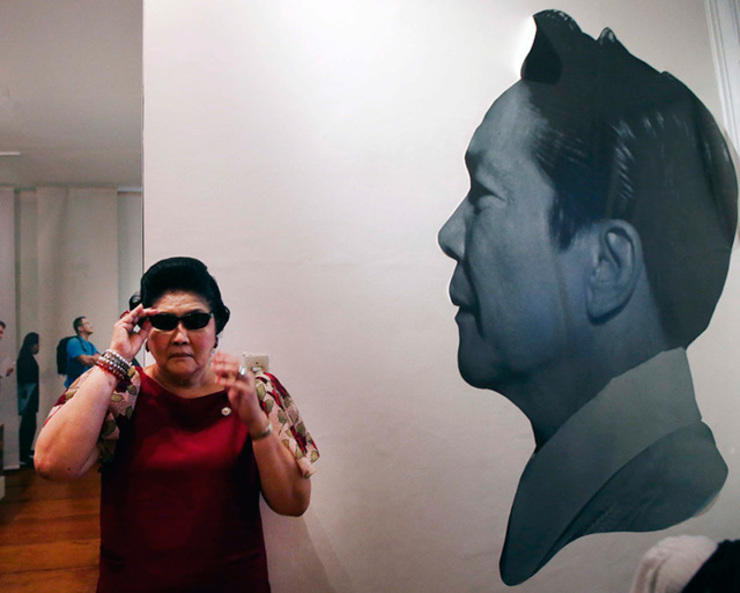 Further study from American academic David Wurfel also suggests that Marcos had already signed Proclamation 1081 as early as September 20, but he needed an immediate justification for doing so. In end, the dictator had the said document dated September 21, believing that good luck is always associated with any number divisible by 7. When Sauron’s true intentions for forging the great rings was finally revealed, the Dark Lord immediately waged war against the Elves, and began besieging the Elven realm of Eregion. After two years of seemingly endless fighting, the Elves were finally defeated in battle and their once flourishing kingdom utterly destroyed. Their king, Celebrimbor, was also captured by the orcs and was brought to Mordor, where he was tortured and eventually killed. The survivors, however, continued their resistance, retreating to a valley to the north which eventually became the Elven kingdom of Rivendell. This was also the case with Marcos. After declaring Martial Law, the military began rounding up both student activists and suspected communist leaders. The regime also arrested prominent opposition leaders such as Senators Benigno Aquino Jr. and Jose W. Diokno who were both incarcerated in Fort Bonifacio. And to ensure unanimity of opinion, the government detained hundreds of journalists and closed all publications that were critical of the regime. The Martial Law regime’s system thought control was so severe that it is believed to be responsible for the disappearance of Primitivo Mijares. A once-favored journalist of President Marcos, Mijares fled to the United States shortly after the declaration of Martial Law, then wrote the book titled “The Conjugal Dictatorship,” which reveals the abuses and corruption of the Marcos family and their cronies. His whereabouts have not been located up to this day. This is what Gandalf told his fellow istari (wizard) Saruman after learning of the latter’s decision to join Sauron and getting hold of the One Ring for himself. For Gandalf, the Dark Lord’s craving for power is insatiable and it would be foolish for Saruman to think otherwise. Marcos also displayed the same tendency, as he kept power for himself. After the declaration of Martial Law, for example, a new Constitution was ratified in January 1973 which provided for a shift from a presidential to a parliamentary form of government. Under this setup, the President was the symbolic Head of State while executive power lies with the Prime Minister, with legislative authority vested in a unicameral National Assembly (later replaced by the Batasang Pambansa). However, despite these legal provisions, Marcos continued to exercise lawmaking powers and refused to call for legislative elections until 1978. He also assumed the position of Prime Minister, relinquishing it only in 1981 to Cesar Virata. Unfortunately, despite his formal position as head of the government, Virata was simply a mere figurehead since real power was still in the hands of Ferdinand Marcos. That was what Sauron sought to do by presenting himself to his minions as a god. In fact, the Easterlings (tribes of Men east of Mordor) worshipped Sauron as their deity. And if you’re a god, you don’t really expect someone to disobey you. Of course, Marcos wasn’t crazy enough to portray himself as a god. But he did cultivate an image of a strongman who was the sole hope of the country. In his campaign sorties for instance, Marcos promised that, “this nation will be great again,” and that he alone had the will and the vision to lead the Filipino people to the bright future that they deserve. In fact, Marcos’ megalomania was so intense that he had his likeness emblazoned on the five-peso bill and ordered his engineers to build a giant bust of himself along a portion of Marcos Highway that leads to Baguio. When these structures failed to awe people into submission, his regime would then use force and intimidation to keep everyone in line. In fact, the Marcos regime was so brutal that according to Prof. Alfred McCoy of the University of Wisconsin-Madison, it was responsible for 3,257 cases of extrajudicial killings. This is in addition to the more than 35,000 who were tortured and the more than 70,000 who imprisoned. So, if you think that Marcos was the best president we ever had, think again. He may seem appealing with his warm smile and victory sign, but remember that even Sauron the Dark Lord can disguise himself as the beautiful Annatar offering gifts. Both never shared power.